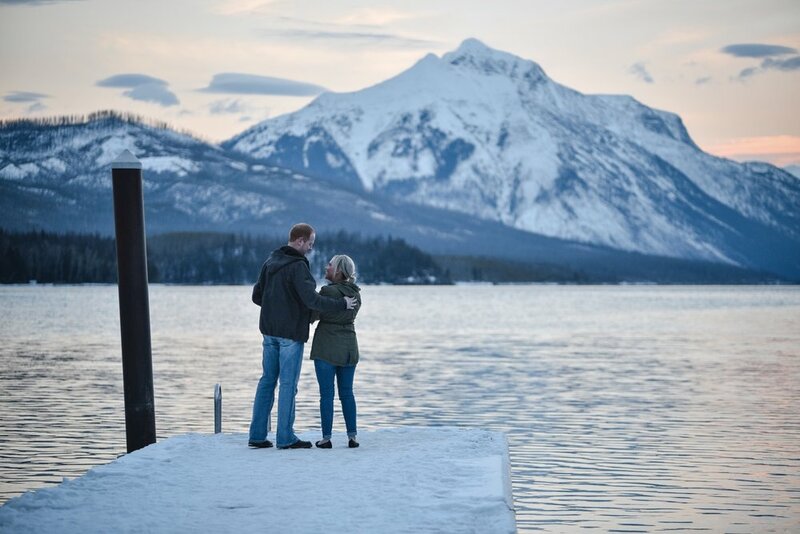 She thought they were just driving out to glacier to see the sunset from Apgar dock. 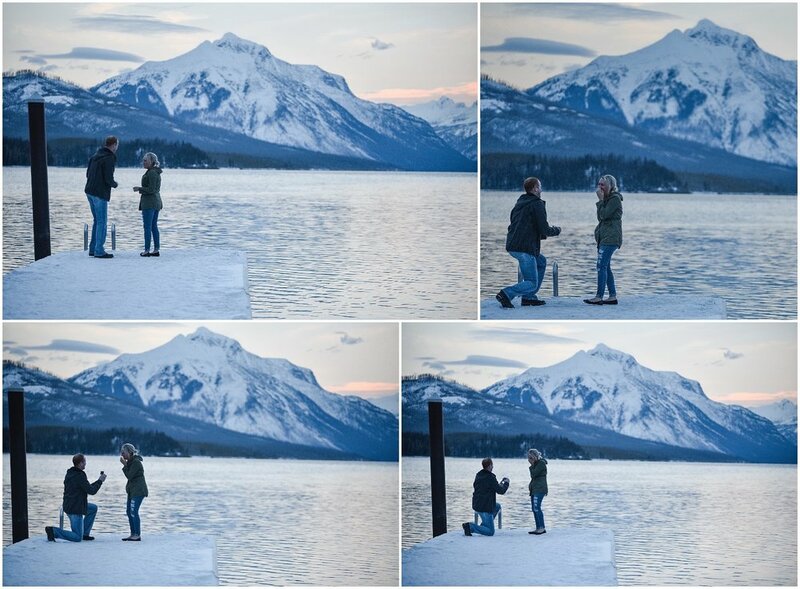 They took photos, hugged and then… he got down on one knee and proposed to the love of his life. Such authenticity in the proposal and in them both. (ON MY END)— They were running a little late. When I arrived, the sun was perfectly glowing on those glacial peaks. Couple after couple (& some families) kept coming on the dock for a look. I was nervous I was going to miss it as I’d never met them before. The light kept changing and my fingers practically frozen. Then I got the text that they were coming. “We’re here- Tall redhead”. - whew! It was beyond beautiful and she said yes!!! There was a woman down on the shore with me right when I got the text and she commented on how beautiful it was. I curtly said, “yes, yes it is”. She then introduced herself, asked my name and asked if I was a professional. She went on to say (and this is all when Greg is ‘casually’ leading her out to the dock) do you work for the paper? I was vague and not trying to be rude, but I didn’t want to miss the moment. Once they got far enough away, I whispered, “he’s going to propose to her” and kept shooting. You just never know what is going to happen when nothing is staged! Ha! But Greg played it so cool and she had NO idea I was even taking photos until after she said yes, he yelled, “HI LINDSEY”… and then told her. The woman on the shore probably helped make it seem like I was there just getting scenery photos. Such a beautiful and real moment. I was so happy to have captured it for them. 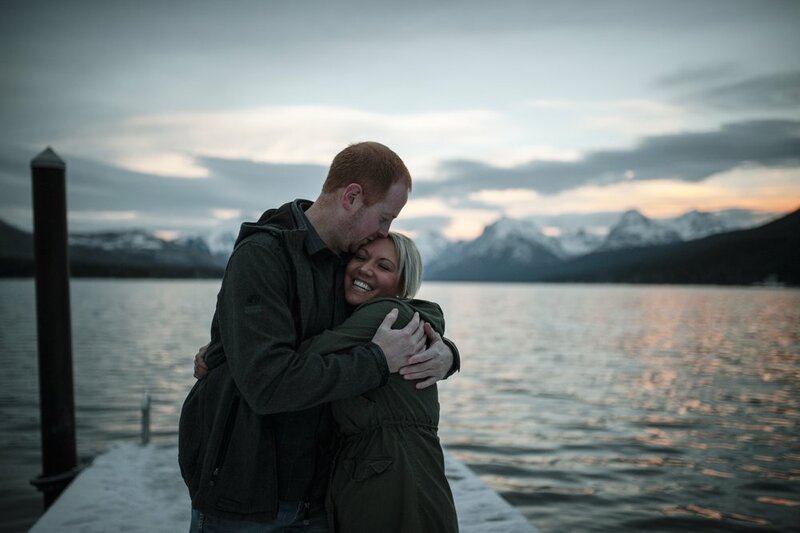 Next blog, their engagement photos! Congrats you two! It was so much fun (and so many nerves…) capturing this for you. You are the cutest!